Health experts from around the state attended this week’s Conference for Change: Colorectal and Lung Cancer Screening Innovation, hosted by ScreenNJ, the New Jersey Primary Care Association and Rutgers Cancer institute of New Jersey. The aim of the event was to learn more on how to improve screening rates and make recommendations to ScreenNJ, a statewide cancer screening education and awareness program. From left: panel moderator Mary O’Dowd, executive director of Health Systems and Population Health Integration for Rutgers Biomedical and Health Sciences; Dr. Antoinette Stroup, director of the New Jersey State Cancer Registry; Dr. Jennifer Tsui, Rutgers Cancer Institute population scientist; and Dr. Michael Steinberg, director of the Rutgers Tobacco Dependence Program. New Brunswick, N.J. – Health care providers, community members, and researchers from across the state came together this week at the ‘Conference for Change’ event, hosted by the New Jersey Primary Care Association and sponsored by ScreenNJ to address screening among two of the most common cancers – colorectal and lung. At the Conference for Change, participants discussed comprehensive strategies to increase screening rates as well as promising practices. Data gathered at the conference will be developed into recommendations for the ScreenNJ program led by Rutgers Cancer Institute of New Jersey and funded in part by the New Jersey Department of Health. 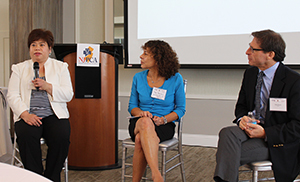 The New Jersey Primary Care Association moderated a panel during the conference on how Federally Qualified Health Centers (FQHCs) are transforming colorectal and lung screening rates in the communities they serve. In addition, several partnering organizations from across the state contributed their expertise to the event. “New Jersey is ranked fifth in the U.S. for cancer incidence and lung and colorectal cancers are among the most common and deadly in our state. With that, it is important for us to get the word out that effective screening programs are available,” notes Rutgers Cancer Institute Director Steven K. Libutti, MD, FACS. “Patients with these types of cancers have better outcomes if detected early through proven screening methods. Unfortunately, many of these cancers are found at a later stage and screening rates are low, especially in several New Jersey counties, which is why we helped initiate ScreenNJ with the state Department of Health. I’m pleased to say that our inaugural year has been spent developing important partnerships, as well as identifying strategic research needs to help reduce cancer disparities and save lives,” added Dr. Libutti who is also the senior vice president of oncology services at RWJBarnabas Health. Rutgers Cancer Institute of New Jersey Executive Director of Statewide Affairs Dr. Susan Goodin shares remarks about the need to improve screening rates for colorectal and lung cancers at the Conference for Change event aimed at making recommendation to the ScreenNJ, a statewide cancer screening education and awareness program. Education and training on tobacco mitigation, and screening for lung and colorectal cancers geared toward clinicians across the state also has been a focus of ScreenNJ – along with the development of clinical decision support tools and practice strategies. In addition, many of our community based primary care provider partners have been supported by ScreenNJ to enhance their cancer screening and patient navigation programs specifically designed to reach diverse and underserved populations. FQHCs conduct colorectal cancer screening, smoking cessation programs, and assist patients with lung cancer screening referrals. Through its partner organizations across the state, ScreenNJ is committed to reducing cancer incidence and mortality through an effective cancer prevention and screening program. To learn more about ScreenNJ visit www.screennj.org. (From left:) Dr. Flordeliz Panem, chief medical officer of North Hudson Community Action Corporation; Dr. Rina Ramirez Alexander, chief medical officer of Zufall Health Center; and Dr. Andy Berman, division director for the combined Division of Pulmonary and Critical Care Medicine/Allergy of Rutgers New Jersey Medical School, spoke at the Conference for Change event focused on improving colorectal and lung cancer screening. 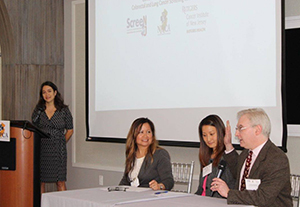 The aim of the event, hosted by New Jersey Primary Care Association, Rutgers Cancer Institute of New Jersey and ScreenNJ, was to gather data and share recommendations to ScreenNJ, a cancer screening education and awareness program. “In New Jersey, Federally Qualified Health Centers are leading the effort to screen for colorectal cancer among our patients. What we are doing is making an impact because colorectal cancer is the second leading cause of cancer deaths in the United States among men and women combined. In New Jersey, screening is above the national average compared to FQHCs across the country. 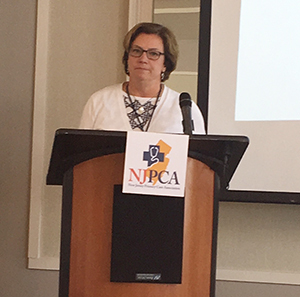 We even have two Health Centers, Zufall Health Center and North Hudson Community Action Corporation, who have paved the way with high screening rates and shared best practices at the Conference,” said NJPCA President and CEO Jillian Hudspeth. Primary care physicians, including those who work in FQHCs, play an important role in cancer detection. While often the first to detect health abnormalities that may later be confirmed as cancer, they play an equally important role in the prevention of cancer. FQHCs provide prevention services as well as management of acute and chronic medical conditions. Along with world-class treatment, which is often fueled by on-site research conducted in Rutgers Cancer Institute laboratories, patients and their families also can seek cancer preventative services and education resources throughout the Rutgers Cancer Institute and RWJBarnabas Health footprint statewide. To make a tax-deductible gift to support the Cancer Institute of New Jersey, call 848-932-8013 or visit www.cinj.org/giving. Follow us on Facebook at www.facebook.com/TheCINJ. The New Jersey Primary Care Association (NJPCA) is an advocate for community health centers as well as a provider of comprehensive education, training, and technical assistance to health centers in New Jersey. NJPCA currently has 24 health centers, one of which is a look-alike and 134 satellite sites providing healthcare services to over 500,000 people in New Jersey. For more information about NJPCA, please visit njpca.org. Federally qualified health centers (FQHCs) are in every state across the nation. FQHCs are authorized under Section 330(A) of the Public Health Services Act to provide healthcare to the medically underserved. Many health centers and their sites are specially designated to serve the needs of special populations including homeless populations, public housing residents, migrant and seasonal farm workers, veterans and school-aged children. For more information about the HRSA Health Center Program, please visit bphc.hrsa.gov/about/index.html.